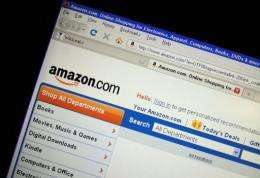 Online retail titan Amazon.com saw its stock price soar after the release of quarterly earnings figures that trounced forecasts, with sales skyrocketing in the first three months of the year. Sales rose 34 percent to $13.18 billion while net income sank about the same percentage to $130 million when compared to the same quarter last year, the Seattle, Washington-based firm reported. Amazon said that it continued to invest in digital television shows, films, and books for its "Prime" online service or hot-selling Kindle e-readers. "I'm excited to announce that we now have more than 130,000 new, in-copyright books that are exclusive to the Kindle Store -- you won't find them anywhere else," said Amazon founder and chief executive Jeff Bezos. "Kindle is the bestselling e-reader in the world by far, and I assure you we'll keep working hard so that the Kindle Store remains yet another reason to buy a Kindle." Amazon's stock price jumped more than 12 percent to $220.30 a share in trading that followed the release of the earnings figures.